Muck diving – diving in muck? What’s it all about? It might be something new for non-divers, but talk to any diver worth his salt and you will usually see their eyes light up with interest and stories of what they have seen will soon be the topic of conversation . According to Wikipedia “ Muck diving gets its name from the sediment that lies beneath most dives: A normally muddy or "mucky" environment. Other than the muddy sediment, the standard muck dive may consist of dead coral skeletons, discarded fishing equipment, tires and other man-made garbage. In addition, the visibility is usually subpar to the reef or wreck sites of the area.” It's the "muck" itself that makes them so different and interesting. The muck is the perfect habitat for unusual, exotic and juvenile organisms that make their homes in the sediment and "trash" that compose a muck dive. South East Asia is the main area for muck diving especially in countries like Malaysia (mainly Kapalai and Mabul, in Sabah), Indonesia (mainly the Lembeh Straits, Manado), Philippines (Anilao ) and Bali. This is because the muck in those locations is just perfect for the amazing creatures that you come across while diving here. Creatures like colourful nudibranches, Anglerfish (Frogfish) Shrimp, blue-ringed octopus and rare pygmy seahorses will make divers quiver in excitement which usually leads to frantic banging on their tanks to attract the other divers to look at the treasure found. Once upon a time in Sabah, everybody wanted to dive at Sipadan and nowhere else. They all wanted to see the “big stuff”. However a clever Japanese man and his friends decided to have a look around Mabul island which is near Sipadan . They applied for some land over the sea and built a resort. Selling mainly to the Japanese market, they soon had droves of Japanese divers who seemed to like diving around Mabul island and the sandbank at Kapalai . This got most of the local dive resort owners curious and before long the secret was out. Mabul and Kapalai was a Mecca for all things macro and weird. Many of the Japanese had seen the big stuff and now were in search of the smaller and rarer marine creatures. Pretty soon, Mabul and Kapalai was on the diving agenda even for divers staying on Sipadan . As a diving destination, Sabah is truly blessed as we have the best of both worlds, from large pelagics to tiny tiny critters. The islands just off Kota Kinabalu are home to many small critters from the Hairy Orang Utan crab to the elusive Mandarin fish and we also gets visit from the Whale sharks during the krill season. Hammerhead sharks come on their annual migration to Layang Layang in the North of Sabah and of course we have the world famous Sipadan Island on the East coast of Sabah. Just after the Chinese New Year holidays this year, my dive buddy and I went to Mabul for a dive holiday. We got our permits and did 4 dives at Sipadan . We saw all that we were supposed to seat Sipadan , such as the black tip and white tip Sharks, reef sharks , turtles, schools of Barracudas , Jacks and the Bump head parade which was all great , but somehow was not as rewarding as the other dives that we did in the muck around Mabul and Kapalai. move. Someone found a tiny juvenile Orange frogfish; it must have been about 2 cm in size being tossed around in some leaf litter by the wave action. We also found a couple of sea horses in the same area and a number of Dwarf lionfish, who seemed to be parading with their erect spines . Moving on we came to some artificial reefs built by the resorts. A whole group of squid were hanging around and on the structure itself, was a yellow frogfish (Angler fish) and a few Nudibranchs. Poking through the old tyres at the bottom I found a few Banded boxer shrimps and some clingfish swimming in-between the tentacles of sea urchins. Just as we were about to start our Safety stop before ascending, the dive master called us over to an old Milo tin next to the boats anchor line. Hiding inside was the rare flamboyant cuttlefish. It was only about 6cm and it was camouflaging itself to look like the sand but soon started to give out its warning lights when everybody crowded around taking photographs. The whole body was flashing from bright yellow to white to chocolate brown and vermillion. This was the perfect ending to this dive. The next dive was at the house reef at Kapali , where we found more frog fish , ornate ghost pipe fish , peacock coloured mantis shrimp scurrying from the rocks into their burrows, large potato groupers and a couple of crocodile fish . A school of jackfish (Not less than a thousand in the school) came swimming past and gave us a wonderful display that looked like a shimmering curtain of silver fish. We also found a very beautiful black flatworm with a bright pink border on its frills. The next morning for our last dive, we decided to do Lobster wall at the back of Mabul Island. This site is well known for its nudibranchs , rare pigmy seahorse and other macro stuff. Together with us in the boat were five ladies from Hong Kong all armed with formidable looking cameras? It was their last dive as well and they were on a mission to find the “Pikachu” nudibranch. 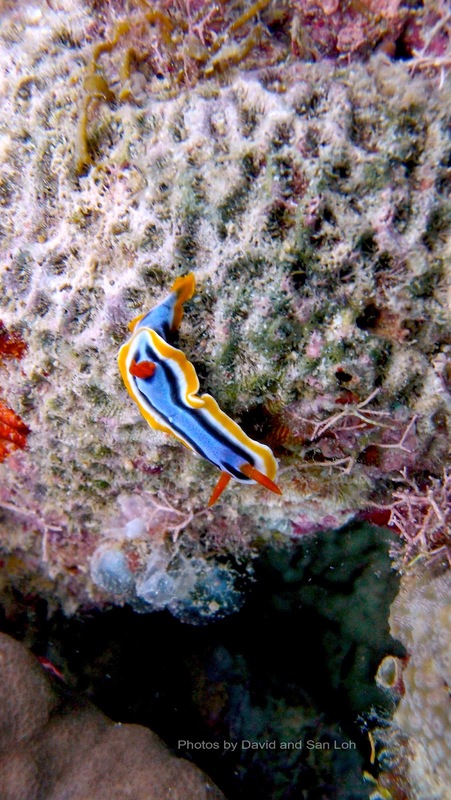 Nudibranchs are very colourful sea slugs that come in various shapes, sizes and colours and there are supposed to be over 3000 of them in the world, but I don’t think anyone really knows how many there really are. The water temperature was a very pleasant 29c , the sun was shinning and there was no current with visibility at around 15m. It promised to be a great dive. At about 10m deep , there was already lots of clanging on tanks as the divers spotted something interesting . We saw loads of Nudibranch on that dive with some notable ones and we were very fortunate to also see the “Pikachu” nudi, which is from the “Thecacera sp”.There were a few Orang Utan crabs with their hairy red bodies and yes, we did see a couple of lobsters, so the dive site did live up to its name. The dive master pointed out the very tiny pigmy sea horse to us, it was pink and about 1cm in size. It looked like a tiny pink worm on the soft coral .One can only really appreciate it when you look at the photographs. 3 well camouflaged stone fish were also spotted and my dive buddy was so excited in photographing a nudi , did not notice and almost rested his hand on one of them. Just as we were ascending I spotted what looked like an old log amongst the coral. I thought my eyes were playing tricks on me as I saw it move and on closer inspection it turned out to be a very large moray eel about 1.5m in length. You should have seen the smiles on the faces of the divers on the boat trip back to the resort and the passing around of cameras to see who had the best shots. Yes, we do have some incredible Muck diving in Sabah ! !